Mike Napoli finally had his breakout, and the baseball world noticed. Napoli — who has batted below .200 for most of the season — hit .429 (9-for-21) with six runs scored, five home runs and 10 RBIs over six games to claim his third career American League Player of the Week honors. He last received the honor with the Red Sox on Sept. 8, 2013. 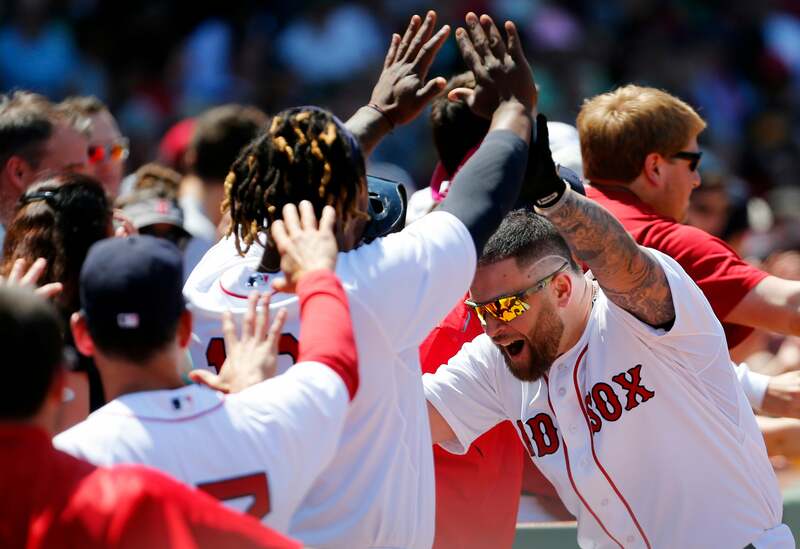 On Sunday, the 33-year-old first baseman went 2-for-3 with a double, home run and four RBIs in the Sox’ win over the Los Angeles Angels at Fenway. During the weekend series against the Angels, Napoli went 5-for-9 with four home runs and eight RBIs in the three games. He became the first Red Sox player to homer in at least three straight games since David Ortiz did so from July 21 through 23, 2014 at Toronto (also four homers in three games). What turned things around for Nap? Some are saying the spark came from a nine-year-old boy who was asked to sign the bat of the Sox slugger before Thursday night’s game against the Rangers. Since April 25, the 2012 AL All-Star leads all Red Sox hitters with eight home runs and 19 RBIs.